Take the warm scent of Italian Bergamot and blend it with natural raspberry flavor and swirl it into South Indian black tea and what you are creating is a raspberry dream of a tea. This tea, if made with powdered milk, honey, vanilla syrup and a packet of stevia becomes creamy. Top with whipped cream and a sprinkle of sugar and you have a honey and vanilla raspberry bergamot tea. I don't think you can only use one teabag. I use four in 16 ounces and like it a little stronger. It is like a raspberry chai without the spice. 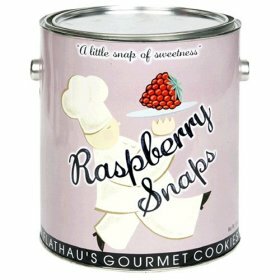 Perfect for tea parties or sipping in the morning while enjoying a raspberry muffin. The people who pick the tea leaves are paid a fair wage and the positive energy really does come through in the flavor of the tea. The tea leaves are also organic. I think this is the most delicious tea I've ever tasted! Once you try this flavor, you will want to try all the flavors. I'm trying the green tea with mint and also love the Fireside Chai. Black teas from Assam, Indonesia and Africa, vanilla, cinnamon, licorice, cardamom, anise, American Panax ginseng, guarana and cola nut are the main ingredients in this energy enhancing drink. This has more caffeine than cola, less than coffee and much less than a double espresso. Well, that is if you only use 1 teabag. Two teabags will give you 120 milligrams of caffeine. While this might not be the tea you want to reach for right before bed, it does wake you up in the morning. 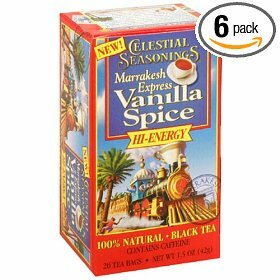 Celestial Seasonings also makes a Teahouse Chai mix (decaf) in Vanilla Ginger Spice and a few teaspoons (or up to 1-2 tablespoons) can be added to the tea to make this a creamy dreamy drink to sip while you eat some banana muffins. By adding the spice mix, you also add honey, cinnamon, clove, cardamom, clove, anise, ginger and Tahitian vanilla. These two teas go very well together and warm you nicely in winter. The brew actually looks a little like hot chocolate when you mix them together, so whipped cream and nutmeg might be an option. So, if the Vanilla Spice seems a bit mild, try mixing in the Teahouse Chai mix and I think you will be very satisfied with the combination of spices. Not creamy enough? Add in some powdered milk or a dash of cream. 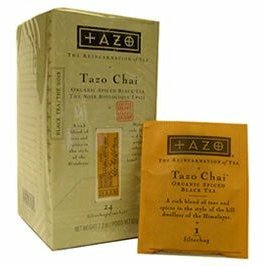 Tazo Chai Organic Spiced Black Tea is a blend of black tea, ginger, cinnamon, black pepper, cardamom, cloves and star anise. These items are all organically grown and this creates a sense of purity and clarity of thought. 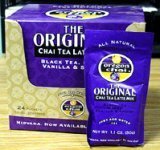 The tea has a delicious rich flavor and is perfectly blended for an ultimate Chai experience. Delicious when you add a packet of Stevia and a swirling of orange blossom honey. Milk powder makes this richer and a dash of cream makes it luxurious. While drinking this tea you are transported to India where Chai wallahs sooth your soul with a cup of spicy tea. Each cup of Tazo tea is an adventure and this tea is especially enhanced by listening to Shiva Rea's Yoga Rhythms CD. Find yourself a cup of tea; the teapot is behind you. 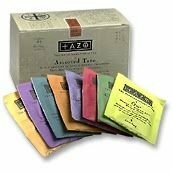 all the delicious Tazo Teas and will list all my favorites as I find them at Amazon. 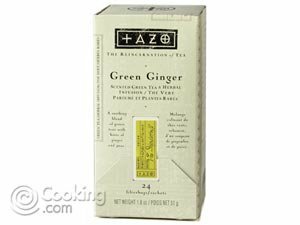 Dedicated to my Tazo Tea Friend who introduced me to Green Ginger Tazo Tea. A few weeks ago while watching a Friends show (on DVD) I noticed a teakettle on the stove and thought it might be interesting to own a red teakettle after years of making tea in my coffee maker. The result is a more pleasant and comforting tea experience. Not only do you drink the tea sooner, it tastes much better when the water is at a full boil. The whistle on this teakettle is amusing and you may have to adjust the temperature to get just the right whistle. Boiling the water too slowly produces a funny "who is that whistling" in my kitchen experience. At full boil, it gets your attention, but is never irritating. If you are really careful, you can remove the whistle and pour the water out immediately, but waiting a few seconds is probably advised. 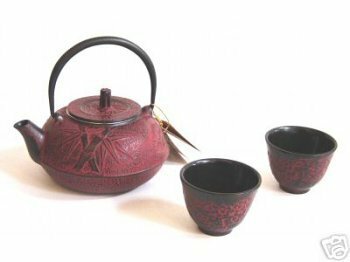 The handle is very sturdy, unlike other teakettles that swing about as if you were not about to pour boiling water. This one feels very safe and the lid also fits very securely so there is no steam escaping out of the top and the handle never gets warm. The color is a deeper dark cherry at the base and then it slowly changes to a beautiful cherry red at the top. A truly beautiful addition to your kitchen if you want to spice up your stovetop. This is an item you will want to leave out on the burners even when not in use. 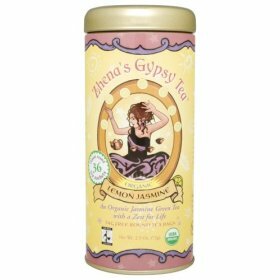 Zhena's Lemon Jasmine Gypsy Tea is tinged with the delicate sea green of faraway places and glints of lemony sunshine. Blend in orange blossom honey to enhance the citrus elements. This tea is rich in antioxidants and vitamins and the Lemon Myrtle is an antiviral and antibacterial herb. This tea is organic and Fair Trade Certified. 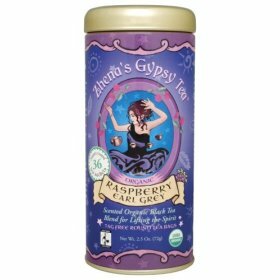 I think the positive energy in the Zhena's Gypsy Tea products comes through in the taste. These teas are infused with additional elements of nurturing - care and love. The Provence Rooibos is an especially delicate Rooibos tea with hints of rose, lavender, rosehip, black currants, raisins and blueberries. Since sampling this tea at a local English Tea Room, I've started to brew this tea at home in my little Denby Greenwich teapot. If you can find it, you might also want to try Celestial Seasonings Red Safari Spice with ginger, cinnamon and blackberry leaves. The loose tea can be placed in a mesh tea ball which saves on using strainers when pouring tea. Inevitably I forget to use the tea strainer, so a tea ball prevents tea leaves swimming in your cup. Since the teapot is made in England, you obtain a more authentic English tea. I'm not sure exactly why, but the teapot retains heat especially well and produces perfect tea every time. I've been using this teapot for the past 10 years and it is well worth the price. Denby Greenwich Pottery can be place in the dishwasher and you can reheat the tea in the microwave if needed. 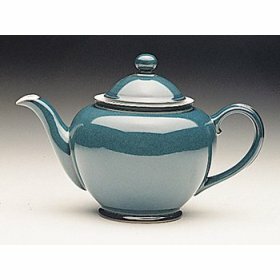 The glaze is especially well done on this pottery and I love using this teapot to make my morning and evening tea. Teas to fall in love with include: Tazo Awake, Celestial Seasonings Red Safari Spice and a tea called Provence Rooibos. Numi teas are blended to an elegant perfection. 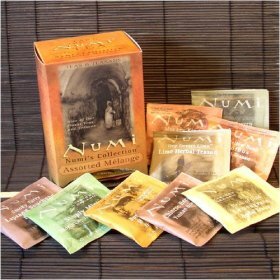 Numi Decaf Black Vanilla is no exception and will please anyone who loves mild black tea with a hint of vanilla. For a richer experience, use two teabags per 8-ounce cup. This tea is perfect for drinking at night when you are relaxing, reading poetry or starting a new novel. The vanilla flavor is enhanced with a dash of cream or even an little vanilla syrup from France. I can recommend Rieme French Vanilla syrup or even a natural cane sugar to add a caramel twist. This tea is quite flavorful and you can even put one spicy tea teabag with a regular teabag and still maintain a full flavor. I haven't tried the flowering teas, but have become intrigued with the Numi teas after trying the Ruby Chai ™ Spiced Rooibos. The quality of the Numi teas is immediately apparent. In a similar way to how the Tazo teas are blended, there is an art to making Numi teas. Each tea is hand-blended with organic whole leaf teas, pure herbs and real fruits. This tea contains Rooibos, Cloves, Allspice, Ginger, Cardamom, Nutmeg and Cinnamon. All organic! Each teabag is a work of art and the flavor of the tea is preserved in a natural filter paper and then packaged in biodegradable and recyclable paper. Can be served with milk or is delicious alone with a natural cane sugar, honey or Stevia. If you enjoy this tea, you might also like Red Mellow, Sweet African Red, Bushmen's Brew or Golden Chai. Now and then I brew one Tazo Tea Awake teabag with one Numi Spiced Rooibos and the result is a mildly spice tea that wakes you up and is very comforting. As a classic Seattle tea, this tea brings back memories of hiding away from the rainy weather sipping a delicious naturally sweet cinnamon citrus tea. When I drink this tea, I am home again. This tea has a unique personality that seems to embody the entire mood of Seattle in one cup. This is a delicious tea that should be brewed for at least 5 minutes to bring out all the flavors. You can sweeten this more if you like with Stevia or a natural sugar to enhance the natural sweetness. It is good with a touch of Muscovado Sugar from India Tree or the RIEME French vanilla syrup. A friend sent me this tea and I've been in love with the slightly bitter flavor. It is quite exotic and fragrant. The ingredients are green teas, natural flavors, ginger and lemongrass. This tea begs to be blended with orange blossom honey. I've tasted many teas and this is by far the most exotic tea I've tried yet. This is pear ginger bliss. The deep purple/red color and hibiscus fragrance is enough to make anyone passionate about tea. Yet, is this really tea? It looks like tea, but it is really an herbal infusion made by steeping hibiscus flowers, orange peel, licorice, cinnamon, rose hips, lemongrass and red poppy in a swirling of hot water. The flavor is slightly reminiscent of hot apple cider or hot cranberry juice. This tea leaves a tingle on your tongue and I think it goes very well with a spoonful of honey. I recently discovered Tazo Teas ad have been immersing myself in the mysterious experience with a sense of abandon. So far I've tried three flavors and have been impressed. I do think you need two tea bags for each cup of tea to fully intoxicate the senses and experience the magic of the ingredients. "Throughout India, chai wallahs can be found serving cups of decaffeinated chai to souls who naturally seek inner beauty at a slightly gentler pace." If you like your Chai with a peppery kick, then this tea will interest you. Rooibos, cinnamon, ginger, decaffeinated black tea, cardamom, ginger, chicory, cloves, star anise and other natural flavors seem to take a back seat to the delicious peppery flavor of this tea. This tea tastes similar to a tea I first tasted in Africa, where Rooibos tea is grown. Best served with milk/powdered milk/soy milk or a dash of cream and some honey. Since this is a decaffeinated tea, it is perfect for late night writing sessions or when you want something calming to drink that doesn't taste like chamomile. I recently discovered Tazo Teas ad have been immersing myself in the mysterious experience with a sense of abandon. So far I've tried four flavors and have been impressed. I do think you need two tea bags for each cup of tea to fully intoxicate the senses and experience the magic of the ingredients. Caffeine Free tea with exotic spices. This "English Breakfast" style tea is quite satisfying and has a darker color than most teas I've made. I just drank a cup of "Awake" and definitely feel invigorated and ready to write reviews. I always get a kick out of their little notes on the back of the tea bag packet that gives the address and then says: "Allow two weeks of this lifetime for a written response." I'd like to say that their teas are best steeped for an extra 5-10 minutes to draw out all the delicious flavors. I use my coffee maker to make tea. Simply put the loose tea in a coffee filter or the tea bags in the coffee pot, then allow the boiling water to drip over the tea leaves. 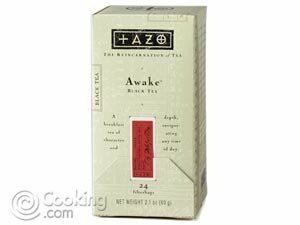 Tazo has quite a good variety of teas, although I tend to prefer the herbal infusions and black tea blends to the green tea. I'm probably brewing the green tea in much hotter water than is required. The sensual blend of exotic spices, teas and herbs used in their teas include a mixture of the following: Black tea, green tea, hibiscus flowers, chamomile flowers, lemongrass, spearmint leaves, blackberry leaves, cinnamon, Rooibos, Gingerroot, rose hips, orange peel, rose petals, licorice root, safflowers, black pepper, lemon verbena leaves, cardamom, cloves, peppermint leaves, chicory, sarsaparilla root, lemon balm leaf, star anise and red poppy flowers. At least this is the mysterious explanation for how they blend their magical tea. I had to go research this topic futher. Undaunted by pop up ads galore, I searched endlessly for information on this great mystery, all while Freedy Johnson was singing "you think I'm made of stone." That should have been sign enough, but onward. 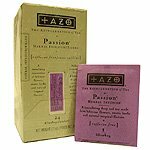 "At various times throughout history, Tazo has surfaced among the more advanced cultures of the day as a calming and lyrical addition to the routines of daily life. During the Tang Dynasty, around seventh century A.D., gifts of Tazo were used to coax various moguls into attending a summit meeting where China was, for the first time, unified. The formulas for these ancient beverages have recently been rediscovered by a team of archeologist and tea scholars and are once again available to stimulate your taste buds and renew your spirit." Then, onward to researching the court of King Zoser, a Lost Princess of Oz, Minoan civilizations and then herbal medicines. It is a good thing I have lots of tea to drink. Now if only I had a chief philosopher with whom I could contemplate the mysteries of this tea. Anyway, when you drink these teas you can at times transcend reality for moments at a time and that is all the truth I need about these teas. Some of these teas even evoke a sense of wonder. What does one have to do? Does one have to travel to the Nile and drink Hibiscus tea while talking to an archeologist to find more information? I also visited a few forums and found others discussing this mysterious tea. Ok, so as predicted by the song, maybe this is all steeped in romanticized tea lore. Yes, this tea company has been mingling fact and fiction in the most amusing of ways. The rock slab carved with mysterious hieroglyphs and titled "Tazo Stone" is just an amusing fantasy and there is nothing wrong with having a little fantasy mingling with your tea leaves. After growing up in Africa, one becomes rather fond of Rooibos tea and I never thought the day would arrive when I would recommend anything but a pure Rooibos tea. 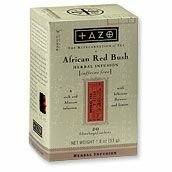 Tazo has taken Rooibos tea to a new level by blending African Rooibos (red bush) with hibiscus, lemon myrtle, lemon verbena, orange peel, rosemary, and lemon balm. Rooibos has quite a distinctive fragrance that reminds me a bit of a fragrant flowers waving in a warm afternoon breeze after an African veld fire. I remember mixing in a tablespoon of condensed milk as a child. Now I mix in powdered milk and honey. Honey seems to bring out the rich flavors in this particular tea blend. For some reason, this blend is rather delicious with a toasted and buttered cinnamon/raisin bagel. I've recently rediscovered the health benefits of Rooibos although I can truly say I've been drinking this tea for most of my existence on this planet. Rooibos is naturally sweet, very aromatic and is high in magnesium, calcium, iron and copper. Mothers in Africa will often add an infusion of this tea to a bottle of milk for babies to cure colic. An application of cold Rooibos tea can also aid in clearing the skin or is recommended for allergies, indigestion, insomnia and nervous tension. 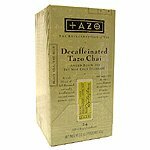 This is one of the Tazo teas that should not be steeped for too long because of all the delicate flavors. If you enjoy this tea, you might also want to try Tazo Honeybush tea. I'm giggling over the Tazo "history" on this package. They do love to amuse. I must say that the Tazo company really has my attention with their packaging, amusing tales of ancient Tazo wheels and they know how to blend tea to absolute perfection. This tea is a true English luxury, but once you taste it, it is difficult to be satisfied with less than the finest tea this company makes. 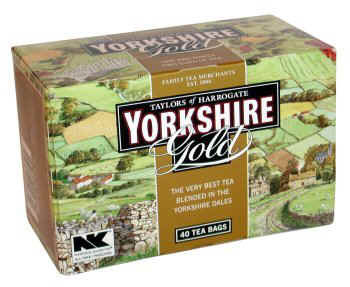 Yorkshire Gold tea has more flavor and character than most teas. The secret seems to be in the high quality of the teas selected for Yorkshire Gold and in the shape of the tea bag which allows for the tea leaves to spread out more and I think this enhances the ability for a full tea flavor to develop. 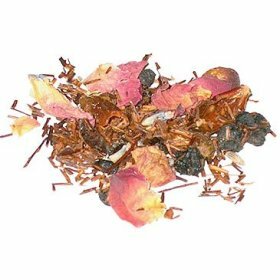 This tea blend is perfect to steep along with a cinnamon stick. It is strong enough to serve with whipped cream and a dash of nutmeg. The art on the box was painted by Lizzie Sanders and it sets a nice English mood for your tea drinking experience. While you can make your own chai tea, it does take some work to gather all the spices and then steep them in milk. The Oregon Chai tea mixes are rather easy to use. You can either make regular tea and add the packet like you would milk and spices or you can serve this with hot milk or even just water. If you are looking for a very creamy version, you can make a 16-ounce cup of hot water in the microwave and then add one packet of Oregon Chai Tea Mix, 1 packet of hot chocolate and 2 Constant Comment tea bags. That is my favorite combination so far. While the tea packets are for an 8-ounce cup, I make a much larger cup of tea, so this is perfect to mix with a tea bag and more powdered milk. Ingredients: Sugar, dried whole milk, dried nonfat milk, natural flavors, dried honey, tapioca maltodextrin, decaffeinated dried black tea and salt. Yes, salt! Each packet is 100 calories. Also look for Ready-to-drink individual servings and liquid concentrates where you just add milk. If you are just using a packet of this mix and 8 ounces of water, you might still want to add some powdered milk to make it extra creamy. Whipped cream and nutmeg also make the drink more delicious. Numi's tea sampler has a lot to offer if you enjoy mild teas. If you prefer stronger teas, then you may want to creatively mix and match for a new experience. The Numi "Morning Rise," organic breakfast blend has elements of smooth perfection when blended with milk powder or cream. This tea has a mild dreamy flavor when using one teabag. You may want two if you prefer a stronger morning blend. If you are looking for an elegant tea, this blend of Fair Trade Certified Keemun, Darjeeling, Ceylon and Assam black tea is sure to impress. Morning Rise is a delicate tea that awakens you slowly to the day and seems to bring a new clarity to the mind. Numi teas are blended to an elegant perfection. 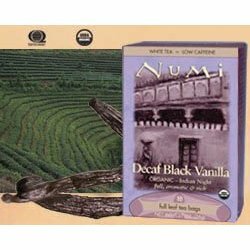 Numi "Decaf Black Vanilla" is no exception and will please anyone who loves mild black tea with a hint of vanilla. For a richer experience, use two teabags per 8-ounce cup. This tea is perfect for drinking at night when you are relaxing, reading poetry or starting a new novel. The vanilla flavor is enhanced with a dash of cream or even an little vanilla syrup from France. I can recommend Rieme French Vanilla syrup or even a cane sugar to add a caramel twist. Numi "Golden Chai" is a delicately spiced Assam black tea that I like to blend with the Numi "Chinese Breakfast" tea made with Yunnan black tea. Together they seem perfect and I like using two teabags per experience. This creates a flowery tea scented with anise and cardamom and spiced with cinnamon and ginger. If you like making chai with milk, heat some milk in a saucepan and then add one or two teabags. It is much more convenient than having to look around for all the separate ingredients and the spices and tea are perfectly blended. Bushmen's Brew "Honeybush," "Jasmine Green Tea" and "White Nectar Osmanthus Spring" make a good combination for a honey/floral tea. Adding in a little honey enhances the experience. With this blend you can enjoy white tea with Osmanthus flowers, green tea with jasmine flowers and honeybush tea with a mild flavor. You may enjoy this as an ice tea in the summer. Numi's "Gen Mai Cha" Toasted Rice Green, Simply Mint "Mooccan Herbal Teasan" and Rainforest Green "Mate Lemon Myrtle Green Tea" can be steeped together to create a delicious tea to pour over ice. Add honey while the tea is hot and lemon juice just before serving.